The Lenovo ThinkPad T61 uses the new Intel Centrino Duo platform (Santa Rosa) and offers a number of design updates. 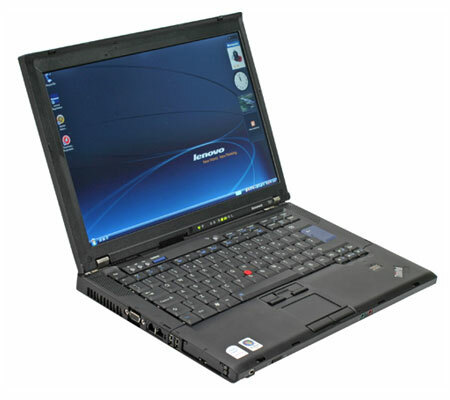 The Processor of T61 is the Intel T7300 Core 2 Duo with 2.0GHz, 800MHz FSB, 4MB Cache and the screen is of 14.1” widescreen with Intel GMA X3100 graphics. The Thinkpad T61 has the Windows Vista Business operating system. The ThinkPad T61 is built with the WXGA 1440 x 900 LG screen display. This ThinkPad T61 is a premium product with a durable build, which is geared towards business users or simply those willing to pay a bit higher on which won’t fall apart after 1-year of use. 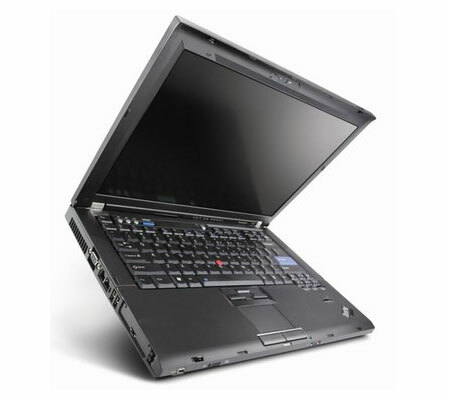 The body of the T61 is made of a rugged plastic, which help in non flex. The magnesium roll cage is kept inside the stiff and thick plastic casing in both the lid and main chassis. The keyboard of the Lenovo T61 remains excellent with a single difference of better spaced side areas; this is because of the body of the ThinkPad T61 is wide. The keyboard is made of spill proof and has two drain holes that carry away the liquid from sensitive components and out through the bottom of the notebook. The T61’s 14.1” widescreen lacks in brightness. The vertical viewing angles on the T61 are poor and whereas the horizontal viewing angles are far better. Another noticeable feature present in the ThinkPad T61 screen is that, it’s off center within the frame there’s a greater bezel area to the left than the right. There is a 100 GB Hard drive with 7200 RPM speed and this hard drive is protected within the magnesium roll cage and shock mounted. So with this option built even if your T61 is dropped the included Active Protection System software will work with the on board accelerometer to detect a fall situation and end hard drive activity to prevent data loss. A rigid and thick metal hinges that attach the screen make certain that the screen does not wobble. The double screen latch system locks are provided that helps to securely make sure the screen stays down when being carried around. The port layout of the T61 has a standard FireWire port and optional media-card reader port. The media-card reader is optional, but it replaces the ExpressCard slot, and also a Smart Card slot in place of the ExpressCard can also be placed. Having a look on the left side of the T61, are the main heat vent and fan, monitor out port, modem and Ethernet LAN port, 2 USB 2.0 ports, ExpressCard and PC card slot. To the right side of the T61 one USB 2.0 port, with an ultra-slim multi-bay drive, which is swappable and can be detached and restored with an extra hard drive or battery. When looking to the back side of the T61, one can have a notice of the 6-cell battery sticking out, and then the power jack and another heat vent. Now on the front side of the T61 is the IEEE 1394 port FireWire port with Wi-Fi on off switch, headphone jack, microphone jack, and the screen opening latch. The ThinkPad T61 speakers are located on the sides of the keyboard, taking advantage of the extra real estate width due to the wide format. The speakers are quiet, which makes your ears to be moved close to your notebook.